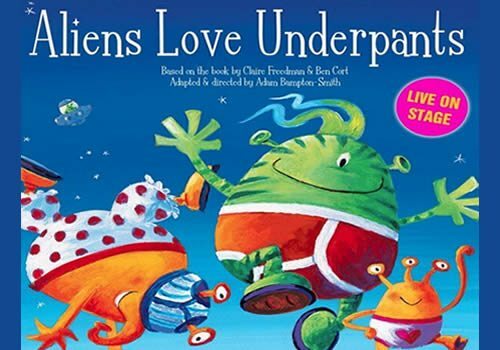 Aliens Love Underpants is a whacky and hilarious stage show that aims to have audience members laughing their pants off! Back in the West End and now at the Dominion Theatre, Aliens Love Underpants is based on the best-selling children’s book by Claire Freedman and Ben Cort. Now imaginatively brought to life on stage by Adam Brampton-Smith, children can now see their favourite alien friends on stage amid their mission for pants! Alien Love Underpants tells the tale of extra-terrestrials from the planet Janet who absolutely love underpants, the only problem is that there aren’t any space! Luckily there are plenty on planet earth….Will the humans start to get suspicious when their pants go missing? Are they ready to face the thieves? Meanwhile, back on earth, Timmy dreams of becoming a space adventurer. As the residents of planet Janet and planet Earth collide, can both Timmy and the Aliens get their wish? Aliens Love Underpants uses colourful puppetry, excellent stage effects and fantastic original music which will delight the entire family. Eve Pearson- Wright, Alex James Ellison, Mark Collier and Abigail Carter-Simpson star in the show which is directed by Brampton Smith and choreographed by Emma Clayton. Will Evans provides lighting design and Isla Shaw provides fabulous costume. The show runs at 55minutes with no interval, so is perfect for those with shorter attention spans. Aliens Love Underpants is a show aimed specifically at youngsters but is fun for all of the family. Please not, the venue is not suitable for children under the age of three. Click here for the Dominion Theatre seating chart and seat price guide.